“The thing women have yet to learn is nobody gives you power, you just take it,” said Roseanne Barr, and this edition of BarCamp Prishtina was about sharing stories which proved that Kosovar women were, are, and will be always empowered. As this BarCamp’s edition held on Tuesday was close to the Week of Women, the community decided that the thirtieth edition of BarCamp Prishtina had to be all about the success stories of strong and successful women. 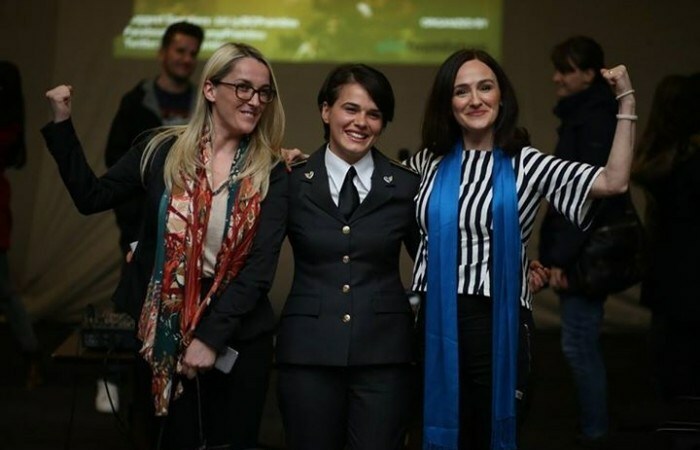 Three speakers were invited in this edition of BarCamp Prishtina, consisting of Arbana Xharra, Ilire Çelaj, and Manushaqe Nura. Personal stories were shared, including being a woman in army dominated by men, an actress in a country full of prejudice, and a brave journalist, thereby establishing a close relationship with the audience. As usual, this edition of BarCamp took place at the Oda Theatre, where people could gather, socialize, listen to speeches, ask questions, and share their own ideas. This BarCamp had 200 registered participants eager to listen to inspiring stories and share their own thoughts in different issues raised. Arbana Xharra shared with the audience her story on being a very successful journalist, and all the obstacles she had to deal with as a woman in journalism. She is currently editor-in-chief of “Zeri” newspaper and has recently received the International Women of Courage Award from the US State Department. She stated: “I could never be a successful journalist without the help and support of my family, even though they received many threats and blackmails because of my job”. Ilire Çelaj, a well-known actress, and also a professor shared her story on how this profession changed her, and how she had to deal with all the prejudices for being an actress in Kosovo. “To be a BarCamp speaker is a challenge for me, because I usually know what I have to say from the scripts”, said Ilire, who also stated that being a professor made her a better listener, and gave her a new perspective on how good-hearted and creative people can be. Manushaqe Nura is a Platoon leader in the Rapid Reaction Brigade in Kosovo Security Force (KSF). “I am very excited to speak through a microphone, because I usually have to speak out loud in front of soldiers, holding only a weapon in my hands” – said Manushaqe, who had not been used to hold long speeches in front of people. She shared with the community her story full of challenges, in becoming one of the most successful women in our army. She is simply a girl from a post-war country who graduated in the same Royal Military Academy Sandhurst as His Royal Highness Prince William. Another edition of BarCamp Prishtina proved that everyone can make their dreams come true if they work really hard. Until the upcoming edition of BarCamp next month, may the force be with you. See you soon in BarCamp Prishtina #31.